Thinking of taking a European city break this year? If so, here are seven European cities that are perfect for exploring on a shorter break. If you’ve got a few days to spare for a quick holiday, then why not consider a European city break? For a little more than the cost of a UK holiday, you could be exploring a new country within a few hours of leaving home. And with budget airlines offering great value flights to cities across the continent, you may find that you’re spoiled for choice. So I’ve picked out seven ideas for cities that are perfect for your 2018 city break. And like Porto, in the photo above, they’re all easy to get to and have lots to see and do. Finland celebrated 100 years of independence in December 2017, and there will still be plenty of events going on in 2018. So if the recent popularity of hygge has sparked your interest in Scandinavia, why not head off to the Finnish capital, Helsinki. It’s a very open and friendly city, making it ideal for a relaxing city break weekend. The second most northern capital in the world, Helsinki is also one of the greenest capital cities. In fact, over a third of the city is given over to parks and green spaces. This means that the city’s look and feel changes with the seasons. Helsinki might not immediately strike you as a foodie destination, but in recent years the restaurant scene has really taken off. There are over 1200 restaurants to choose from, covering all budgets from moderate to Michelin star. And the local Nordic cuisine really makes the most of seasonal ingredients. Restaurant Day is a festival which takes place four times each year, allowing anyone to set up a pop-up restaurant just for the day. If your visit to Helsinki coincides with one of these days, you could find yourself eating soup in a vintage shop or blinis from someone’s kitchen window! Helsinki is also a must-visit for anyone who loves coffee, because the Finns drink more of it than any other country, You’ll find cafes from traditional to trendy, and a fantastic cafe culture to explore. And of course, at the height of summer, Finland is the Land of the Midnight Sun. The sun hardly sets, so your evening can last well into the early hours of the morning! Malta is a small country with a lot to see and do, and its capital city Valletta is the European Capital of Culture for 2018. So this year is definitely the right time to take that trip to Malta! The island has great weather for most of the year, and temperatures are generally above 20C between March and October. So if you’re looking for a city break in Europe outside the main summer months, Valletta is a great choice. The city has gorgeous architecture to see, combining many influences from over the centuries. Be sure to check out the Grand Master’s Palace and the recently restored Fort St Elmo. Malta’s delicious cuisine also makes it a great venue for a foodie weekend. Malta is an ideal place to visit if you love an active holiday, as there are plenty of watersports to try out. And you could combine your visit to Valletta with a visit to Gozo, one of the other islands in the Maltese archpelago. If you’ve already explored Prague and Bratislava, maybe 2018 should be the year when you head to the Balkans? The capital city of Serbia is currently in the process of joining the EU, and still uses the Serbian Dinar. This means that your money will probably stretch a little further than you might expect. Entry to attractions and eating out tend to be quite reasonably priced, making Belgrade ideal if you are on a budget. It’s a city of contrasts, with the Brutalist architecture from the Communist era sitting alongside Austro-Hungarian houses and the cobbled streets of the Skadarlija quarter. Your visit to Belgrade should also take in the ruined fortress of Kalemegdan which overlooks the city. It’s now home to one of the city’s most popular parks, which hosts flea markets, concerts and a military museum. And Belgrade has a reputation as a great city for a party, with clubs that cover every genre of music you could wish for. In the summer, the party moves onto Belgrade’s two rivers – the Danube and the Sava. Dundee is Scotland’s fourth largest city. And while it might not have been top of your bucket list before, it is quickly becoming one of the country’s top destinations. A recent article in the Washington Post even named Dundee as one of the world’s coolest cities to visit in 2018. Getting to Dundee is really easy, as it has its own airport. Alternatively, you could fly into either Glasgow or Edinburgh airports and take the train to Dundee. Or for something very special, you could travel on the Caledonian Sleeper train overnight from London. This year sees the opening of Dundee’s new V&A museum, which is the first time that the V&A have opened a museum outside of London. The stunning new building is just part of the major regeneration programme that is taking place around the bay area of Dundee. There are plenty of hotels to choose from, and great restaurants to try out. Click here to read my review of the Apex City Quay hotel in Dundee. And there’s lots more to see around the city. Dundee hosts the RSS Discovery, the ship which took Captain Scott on his ill-fated voyage to the Antarctic. Or you could visit the McManus Art Gallery and Museum, which celebrated its 150th Anniversary in 2017. And a visit to Dundee wouldn’t be complete without taking a trip up to the Dundee Law, an extinct volcano overlooking the city. The impressive views from the top make the walk worthwhile, and you can treat yourself to cake in one of Dundee’s fantastic cafes afterwards! Brussels and Bruges normally spring to mind when you first think of Belgium. But if youre looking for an alternative city break, then why not head to Antwerp? Belgium’s second largest city, Antwerp was one of Europe’s main ports in the 15th and 16th century. And that history can still be seen in some of the city’s dockside neighbourhood. But don’t think that Antwerp is stuck in the past. It also has amazing modern architecture including the new Port House and the Palace of Justice. Antwerp’s stunning railway station is often described as one of the most beautiful in the world. Away from the architecture, Antwerp has plenty of vintage clothing shops, vinyl record stores and cool cafes to while away your hours. It also has a wide range of museums covering subjects from art to fashion, not to mention the Diamond Museum with its eye-catching displays of jewellery. Want to find out more? Click here to read all about Antwerp, City of Diamonds on The Diary of a Jewellery Lover. You probably don’t need me to suggest cities like Barcelona or Seville for a city break in Spain. But have you thought about going away from the coastline and exploring the interior area of the country? Toledo is the capital of the Castilla-La Mancha region of Spain, and a great location for a city break. You can’t fly direct to Toledo, but the train ride from Madrid is only around 30 minutes. Toledo has been named a World Heritage City by UNESCO, and has a fascinating blend of styles and influences. The gothic Cathedral of Toledo is said to be one of the most beautiful cathedrals in Spain. Inside, it is filled with stunning works of art by Caravaggio, Rubens and El Greco. The large rectangular building overlooking the city is the Moorish Alcazar. Once a palace, it now houses a museum detailing Toledo’s history from Roman times to the Spanish Civil War. And in the Jewish District, the Sephardic museum explores the history and influence of Spain’s Jewish community. Toledo’s cuisine combines all three cultures, and the city’s Old Town has many small restaurants to try out. And of course, in Spain, your evening stretches out well into the night. After sunset, the city’s cobbled streets take on a different light, with plenty of bars and restaurants to discover. Porto has been declared the best European city to visit on three occasions, so it could well already be on your wishlist. But if you’ve never thought of heading to the North of Portugal, there are many reasons to think again. Whereas Lisbon is a large, multicultural melting pot of a city, Porto is smaller and easier to explore in a weekend. It also feels more authentically Portuguese, with more old world charm about the city. The gastronomy in Porto is also a major attraction for many people, with the Portuguese cuisine featuring strongly in the city’s many restaurants. And of course, where could be better than Porto for sampling a glass of Port? The laid back feel of Porto makes it perfect for a relaxed, romantic weekend break. Those are my suggestions for a city break in Europe. Where would you like to visit first? 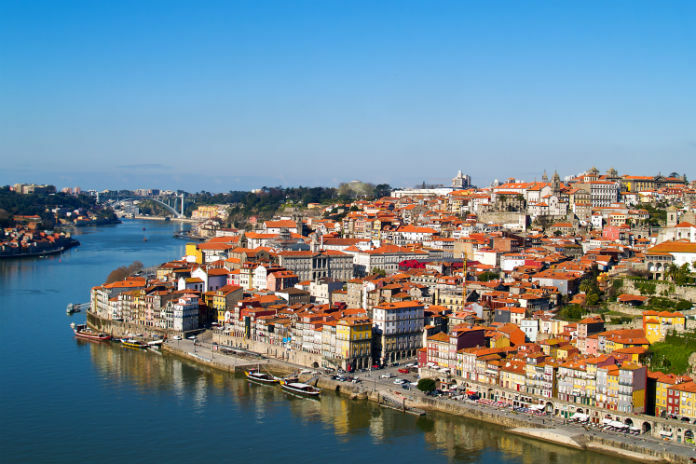 Thanks Emmalene – I really want to visit Porto, it’s been on my wishlist for a while now! Porto is really high on my list as well, it looks like such a gorgeous city!